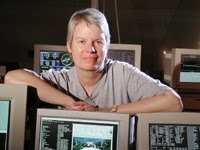 Today, November 24, 2009, I had the privilege and the opportunity to interview Dr. Jill Tarter, the renowned Director of the Center for S.E.T.I. Research, in Mountain View, California. During our conversation, we dealt with the issue of how many exoplanets have been so far discovered. And the number is really amazing: 400! Dr. Tarter also talked about the recent meeting of scientists convened by the Pontifical Academy at the Vatican, to deal with Astrobiology. She was one of the participants. The other relevant thing that is going on, according to Dr. Tarter, is that Astrobiology has taken an enormous importance nowadays, and it is increasingly an open field for the participation in a multidisciplinary work. For the first time –she said—Astronomers, Biologists, Chemists, Geologists etc. are working alltogether, exchanging information and experiences from their own disciplines. That –I think—is the real way to do science.